have the opportunity to achieve a state of complete physical, mental and social well-being and develop to their fullest potential. Listed below are a variety of community health related projects completed by Kimberley Hodgson, as Cultivating Healthy Places’ owner and founder, and as Senior Research Associate and Manager of the Planning and Community Health Research Center at the American Planning Association, and Research Assistant in the Department of Urban Affairs & Planning at Virginia Tech. Advancing Obesity Solutions through Investments in the Built Environment and Transportation | Cultivating Healthy Places’ owner, Kimberley Hodgson, advised The National Academies of Sciences, Engineering, and Medicine on the development of a workshop and workshop proceedings related to the prevention of obesity through investments in the built environment and transportation. ICLEI STAR Community Index. 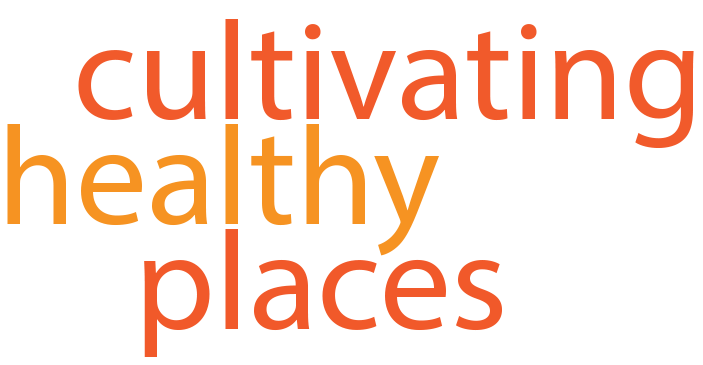 Cultivating Healthy Places’ owner – Kimberley Hodgson -served as the Vice-Chair of the STAR Community Index Health & Safety Technical Advisory Committee, to develop the structure, indicators and metrics that will comprise the health and safety component of the STAR Community Index. Planning Healthy Communities Forum. Design and developed an online public, social networking forum centered on planning and community health. Healthy Communities Interest Group. Initiated a coalition of APA members interested in or actively engaged in the planning and development of healthy, sustainable communities. Healthy Plan-Making Research Study. Received over $100K in funding from the Centers for Disease Control and Prevention to research how local governments across the country are explicitly addressing public health issues in their comprehensive and sustainability plans. Complete Streets. Authored a chapter and several case studies for the recently published Complete Streets: Best Policy and Implementation Practices PAS Report 559. Bridging the Gap. Provided technical assistance and advice to the Bridging the Gap Community Obesity Measures Project (a multi-year, national research project conducted by the University of Illinois at Chicago Health Policy Center) in the development of research criteria and indicators for the analysis of planning policy relevant to active living and healthy eating. Eco-City Alexandria. Assisted in the design and management of the City of Alexandria’s collaborative, sustainability planning process, called Eco-City Alexandria, a process that lead to the development of the City of Alexandria’s comprehensive sustainability vision (called Eco-City Charter) and plan (Environmental Action Plan). Provided expertise in the areas of health, food systems and planning to the City of Alexandria’s Environmental Policy Commission (EPC) and coordinated and managed Eco-City Alexandria’s communication techniques (including community youth engagement activities; website and blog design and development; and public meeting facilitation) to ensure better participation from all stakeholders, especially underrepresented groups. Health Compendium Report. Identified, researched and evaluated model health and sustainability practices (programs, policies, and initiatives) undertaken by local governments across the United States and Canada. The purpose of this report was to provide recommendations to the City of Alexandria on active living, food systems, and other public health policies, programs, and projects. Planning Healthy, Sustainable Communities Graduate Course. Developed a new, multi-disciplinary graduate course (UAP 5424: Planning Healthy, Sustainable Communities) that examined the emerging intersection between planning, public health, nutrition, and food policy; explored the relationship between land use, the built environment, food policy and health, with a focus on obesity, physical activity and healthy eating; and provided students with an overview of contemporary health issues and planning-related solutions. Pedestrian Infrastructure Evaluation Tool. Developed a tool to evaluate, rank and rate intersections throughout Arlington County, Virginia to prioritize pedestrian improvements, including signage, crosswalk striping, sidewalk ramps and curb cuts. Active Living Research. Assisted in the editing and revision of written reports for a Robert Wood Johnson Foundation (RWJF) Active Living Research project on Smart Growth Legislation in Wisconsin that evaluated the adoption of the Wisconsin’s progressive 1999 Smart Growth Law and its subsequent implementation by state, regional and local governments—all within the active living context of how these land use reforms can create the right regulatory environment for more compact development.